Prime Minister Office Job Circular 2018. Bangladesh Government Office Job Circular 2018. PMO Office Job Circular 2018. Prime Minister Office Job Circular 2018 has publish recently. This circular must be apply by online. This year PMO has decided to take 149 members for this post. This Job is recruiting by National Security Intelligences (NSI). PMO will take members for this post in 17 different categories. Such as – Assistant Director, Telephone Engineer, Assistant Computer Programmer, Field Officer, Computer Technician, Computer Operator, Office Assistant, Watcher Constable and Others. 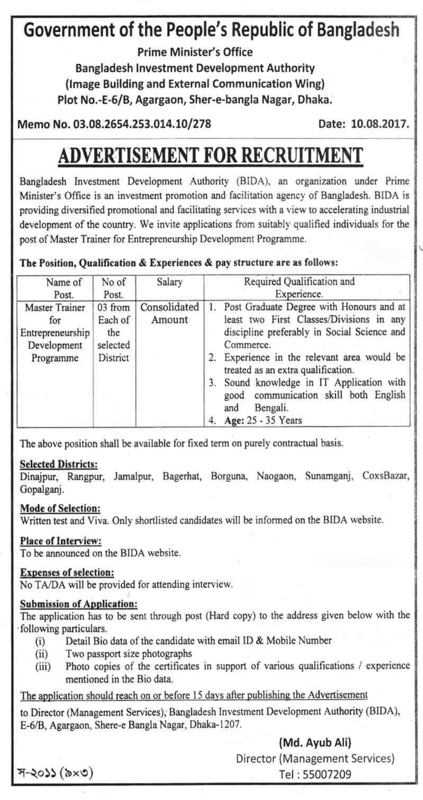 This Job Circular is for all candidates. If you want to apply for this job you must be age of 30 t0 32. 32 year age will be eligible for freedom fighters child. it is also a full time job. If you want to apply in PMO job you can apply by online. You can apply your form by online. Fill up your form keep photo and other necessary information to keep your hand. Than fill up your form according to your certificates. Such as name, birth date, roll number, gender etc. For further any information, please keep your eyes on our website. If you fail in online you can follow SMS. If you fail to apply by online, you can apply in second way by SMS. Reply SMS : Applicants Name, Tk-000 will be charged as application fee. Your PIN(8 Digit Number). When you send message after a few minutes later you will receive a SMS. If your message will be successful then follow the rules below. NSI YES 345678 and send to 16222 of any Teletalk Prepaid Mobile. Reply SMS : Congratulations! Applicants name, payment completed successfully for PMO examination fee. User ID is (xxxxxxxx) and Password (xxxxxxxx).